Okay, so it was May 13th that I posted about finding time for my creativity. The creativity part worked out just great, it was the posting part that I was having a hard time with. So I spent the weekend (the weekend before last) making stuff. Beady stuff. Stuff that involved stringing and wire and wire wrapping and measuring. Out of my endeavors emerged a couple of ideas that I want to share with you. Claudia and I are going to whip those in the next week or so. Hopefully you'll get some grand inspiration from those pieces. Simple design really. I'll work up a more involved tutorial, but here it is in a nutshell, if you want to make a pair right now. (And I hope you do.) They make me feel kind of like a princess. From an exotic far away land. I like that feeling. A lot. The earring measures 61mm (2 3/8") from the top of the gold loop to the bottom of the citrine briolette. It measures 30mm (1 1/4") across at the center bar. 1. I got out some pretty beads from my bead box. I used 4mm Swarovski bicones (the light green), some small faceted semi precious (the purple), some 3mm firepolish (the light yellow). I added an amethyst briolette and citrine briolette to the mix as well as some tiny gold filled daisy spacers. Any small 3-4mm beads will work here. Try out different color combos. Think exotic princess. Or whatever works for you. 4. Then I started stringing the main earring. I cut 6" of .014 SoftFlex beading wire. I started in the middle by stringing the citrine briolette first, then a few beads and then the dangles on each side. I put beads on and took beads off until I had found a pleasing combination. The earring is about halfway done at this point. 5. I put the earring aside for a moment and made the center bar. I used a 2" 24g eyepin (because it was convenient and as eyepins are half-hard wire, it makes the bar much more stable). I strung my center dangle on first and then went out from there adding the other smaller dangles on each side. I turned a loop at the open end. (Making sure that it was facing the same way as the premade loop on the other end). 6. I strung each end of the beading wire through the loops on the center bar. I finished by stringing about 9 beads on each side of the earring. 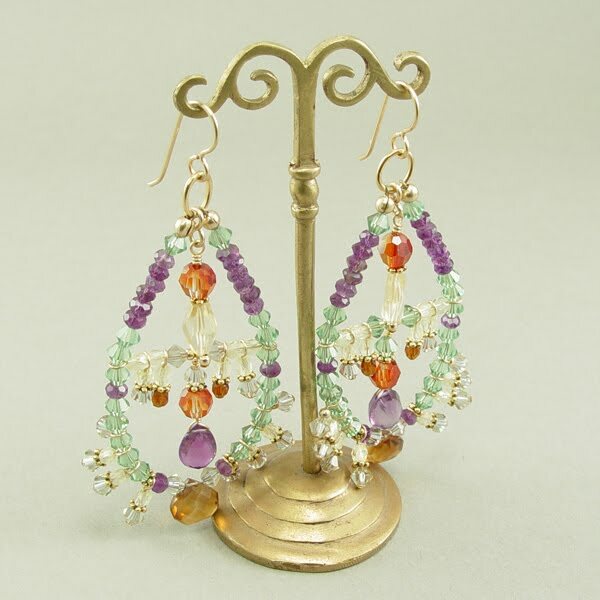 You can always make your earring a little smaller or larger by how many beads you choose to string on. 7. To close the earring I needed a stable, soldered ring to crimp the ends of the SoftFlex to so that the earring would form a loop. I found a length of scrap chain with a size link that I liked and cut a ring away from the link on one side and then the other. This gave me a nice soldered, closed ring. I could have used a jumpring, but I would run the risk of the beading wire pulling through the unsoldered ring. 8. I crimped each end of the earring to the soldered loop, covered the crimps with crimp covers and added an earwire to the top of the soldered loop. 9. I thought that the top space looked a little bare, so I made another dangle using a 2" headpin and a couple more beads and wire wrapped it to the bottom of the soldered top loop. Think about this design as if you are making a little mini necklace. That's just what it is, except instead of crimping off to a clasp, you crimp onto a soldered ring and add an earwire at the top. The resulting earring is light and has great movement. Don't forget to make a second one. It takes about half the time as the first. Let me know if you make a pair, or if you have any questions. Like I wrote earlier, Claudia and I will whip up a little video tutorial and post it in the next couple of weeks. If you need to brush up on your basic stringing skills, you can always check out our stringing class.